As the end of the year approaches, there are still a few weeks to see projects through to completion. In week 48 2018: creative preparation for next year is also on the cards. If you’re in finishing energy, and set up to meet your intentions, ignore the rest of this email. Just power on! If you’re struggling, though–maybe even finding it hard to get started never mind get to “the end”?– it might be that you haven’t done enough preparation. The making phase of any creative project or task–when you’re actually drafting–should go at a brisk pace, with ease. If you’re floundering, or metaphorically chewing your pen, going back to prepare the ground might be your solution. Creative preparation was the theme of our Monthly workshop this month, which you can find on the website workshops page. Each Monday morning, in the Go Creative! in Business Facebook group, we share our creative intentions under three headings: Making (Creative Crafter), Managing (Creative Director), Maximizing (Creative Entrepreneur). MAKING (Creative Crafter): A new poem for my Patreon patrons, Advanced Self-Publishing Salon with Joanna Penn (7pm today, on the ALLi page if any of you are interesting in attending live) and finishing the Go Creative! Notebooks and Planners with Jane Dixon-Smith. MANAGING (Creative Director): New processes for ALLi’s pro members, which includes a new name (Author Entrepreneur Member is the one we’re currently leaning towards). MAXIMIZING (Creative Entrepreneur): Beginning the planning of a virtual book tour for the Go Creative! series early in 2019. What about you? What’s on your cards for Week 48, as the end of the year approaches? I’d love to know how things are going for you, and to see you in our group. Drop by there, or if you’re not on Facebook (or you’re all grouped out! ), leave a comment in the Guestbook. 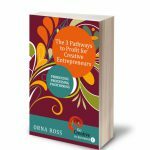 Pre-order Three Pathways To Profit for Creative Entrepreneurs: Practice, Process, Positioning. I now use the “Pre-Order Marketing Method” devised for indie authors. As soon as we hit 1000 pre-orders, I’ll release the book. Creative Pace for Creative Entrepreneurs: Do You Need to Speed Up? Or Slow Down?